My husband and I were both raised in Montreal where trips to the nearby mountains are one of the only ways to survive the endlessly long and frigid winters. 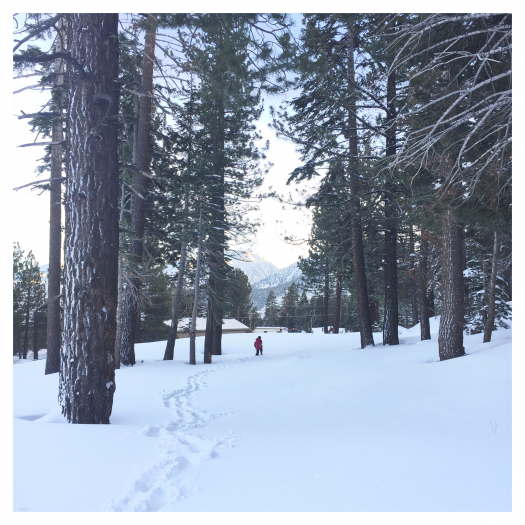 As much as we love living in the sun by the beach, this time of year we always crave the cold, crisp mountain air, walks in the snow and evergreen forests that seem to reach for the sky. So this weekend we found some. We went up to Mammoth with some friends for three days of skiing, apres skiing, tubing and more. I had a lot of anxiety going into it (have to say, so far my anxiety level in 2016 has not been impressive and I am working on changing that asap) because it was our first trip with Luna (who is now four months old!) and even though we were staying at the very pet-friendly Westin Monache, it felt like the weekend would mean lots of stress and little relaxation. Thankfully little Luna proved me wrong. She did great on the drive both ways and happily hung out in her crate in the room while we explored the town (this was our favorite meal in Mammoth — and I haven’t had that many memorable meals in Mammoth…), did some runs and marveled at our kids marveling at the piles of powdery snow everywhere. My daughter took some lessons and amazed me at her progress. There is something so incredible about watching your kids naturally take to something – especially something that you love so much. Skiing behind her and watching her fearlessly make her way down the face of the mountain with a huge grin on her face is one of my favorite joys in life. My son, on the other hand, is taking a little more time warming up to the sport part of our snow trips. He would happily just wander through waist-deep snow, narrating his way under his breath with tales of the ninjas and snowy monsters that lay ahead, just waiting for him to take them down. He is also quite good at apres ski, like his mama, until he spills his hot chocolate all over himself and decides he is done. My husband is most at home in the mountains, I think. He is an avid and long-time snowboarder and while he loves to surf, nothing makes him happier than finding himself back on the mountain. We left him on his own to get lost a few times and when he found his way back, he was definitely happier than when he left. And I guess that’s why we take all these little getaways, isn’t it? It’s always a lot of work to pack up a family and to make your way from point A to point B. It’s always a little too expensive and it’s always kind of stressful. You always end up yelling at your kids at some point or having someone get sick on the drive (it was our daughter this time) or missing a flight. But when you make your way back home, back to the comfort of your own bed and your kitchen and your routine…you are happier than when you left. Oh so true! We made the trek of to big bear (from Carlsbad) and hitting our own sheets last night felt soooo good. But we all woke up a little earlier this morning, ready to get back to our routine and with all those happy memories and plans of our next trip swirling in our heads. Cheers! Knowing where your family’s (and each member’s) happy place is, what can renew and reconnect you just by being there, is so very important. The joy you see in your kids and their experience of the place is recognizable. One of my favorite pieces of yours.